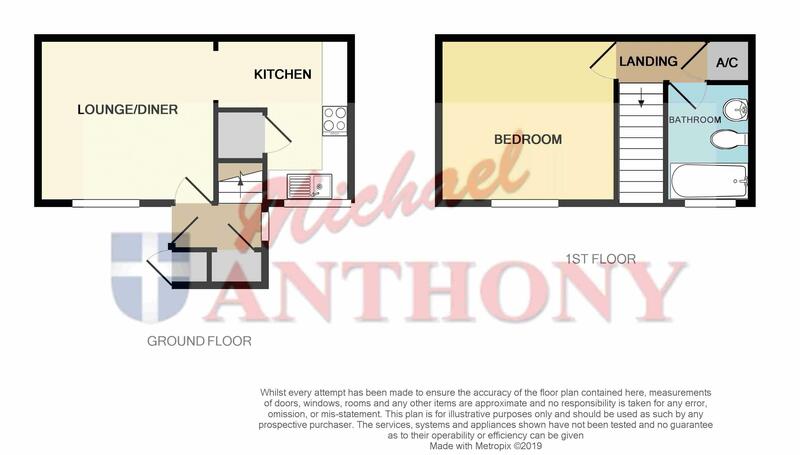 Michael Anthony are pleased to offer this IMMACULATE ONE BEDROOM HOUSE on the popular Deerhurst development. The property briefly comprises entrance hall, lounge/diner, kitchen, refitted bathroom, bedroom and enclosed garden. A VIEWING IS HIGHLY RECOMMENDED, please call 01296 433666 to arrange. Window to side aspect, door to lounge/diner, stairs rising to first floor, cupboard, electric convection heater. Double glazed window to front aspect, electric convection heater, follow through to kitchen. Double glazed window to front aspect, a range of storage cupboards at base and eye level, single drainer sink unit, complementary tiling, electric convection heater, understairs storage cupboard, spaces for a cooker, washing machine and fridge. Doors to bedroom, bathroom and airing cupboard. Double glazed window to front aspect, electric convection heater. Obscure double glazed window to front aspect, a three piece suite comprising a panelled bath with thermo shower over, pedestal wash hand basin, low level w.c., heated towel rail, tiled walls and flooring. Pathway leading to front door, shingled patio and lawned areas.